In 1830, William Teacher took advantage of the new "Excise Act" and began selling his blended scotch. From 1832 he was selling it from his wife's grocery shop in Glasgow. By 1856, with help from his sons, he was granted a licence for consumption and opened his own dram shop. William died in 1876, leaving his two sons William Jr. and Adam in charge. They moved the business to St. Enoch Square where it remained until 1991. Teacher's opened their Ardmore single malt facility in 1898, ensuring a guaranteed supply of scotch for their Teacher's Highland Cream blend. With the end of Prohibition in the United States, Teacher's sent its first shipment on the Cunard steamer "Scythia". Teacher's acquired the Glendronach distillery in 1957, to meet the growing demand for blended scotch. With this increase in demand, Teacher's built a modern blending and bottling plant in Glasgow in 1962. During 1976, William Teacher & Sons Ltd. joined Allied Distillers. Teacher's Highland Cream blend was registered in 1884. 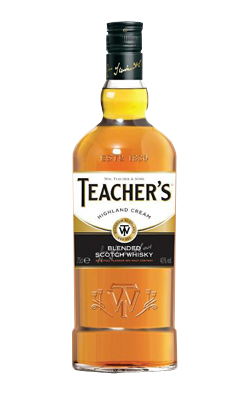 Teacher's uses over 45% single malt, with Ardmore single malt being the main scotch in its blend to make Teacher's Highland Cream blended Scotch. It also uses over 30 different single malt whiskies.